The Icelandic Sheepdog had a large nose and black-pigmented lips. The eyes are medium sized and dark brown. The head is arched with a rather compact muzzle. It has sturdy forelegs and double dewclaws that are similar to those of a Lundehund. The Icelandic Sheepdog is a Nordic herding spitz, slightly under medium sized with prick ears and a curled tail. Seen from the side the dog is rectangular; the length of the body from the point of shoulder to point of buttock is greater than the height at withers. The depth of the chest is equal to the length of the foreleg. The expression is gentle, intelligent and happy. 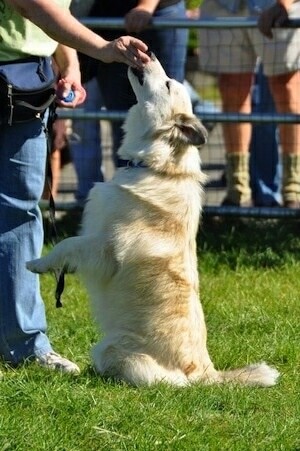 A confident and lively bearing is typical for this dog. There are two types of coat, long and short, both thick and extremely weatherproof. There is a marked difference in appearance between the sexes. Icelandic Sheepdogs are tough and energetic. It is a hardy and agile herding dog that barks, making it extremely useful for herding or driving livestock in the pastures, in the mountains or finding lost sheep. The Icelandic Sheepdog is, by nature, very alert and will always give visitors an enthusiastic welcome without being aggressive. Hunting instincts are not strong. The Icelandic Sheepdog is cheerful, friendly, inquisitive, playful and unafraid. Most adore children and get along well with other dogs and pets. Owners need to be consistent with the rules, calm but firm. They do best with some type of job to do. Usually a fairly healthy dog. 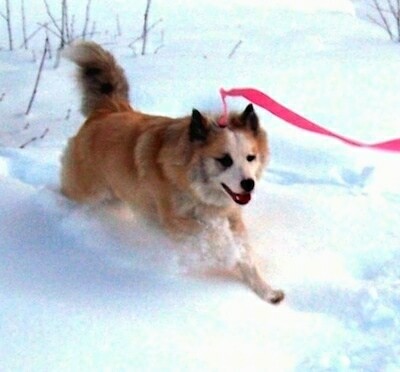 The Icelandic Sheepdog needs a lot of activity and exercise and needs close contact to the family. Many of these dogs have "home-alone anxiety" problems, because they don't like to be home alone. This is a very active breed that needs to be exercised every day. This breed needs to be taken on a daily walk or jog. While out on the walk make sure the dog heels beside or behind the person holding the lead, never in front, as instinct tells a dog the leader leads the way, and that leader needs to be the human. In addition, this breed will enjoy sessions of play. The Icelandic Sheepdog has a double coat, thick and extremely weatherproof. There are two variants, Shorthaired: The outer coat is of medium length, fairly coarse, with a thick, soft undercoat. The hair is shorter on the face, top of head, ears and front of legs, longer on the neck, chest and back of thighs. The tail is bushy and the hair length is in proportion to the coat. Longhaired: The outer coat is longer than the above, fairly coarse, with a thick, soft undercoat. The hair is shorter on the face, top of head, ears and front of legs, longer behind the ears, on the neck, chest, behind the forelegs and back of thighs. The tail is very bushy and the hair length is in proportion to the coat. This breed does shed and normally blows its coat twice a year. It is important to trim the dewclaw nails regularly as because they have no contact with the ground, they can easily become too long. The Icelandic Sheepdog is Iceland’s only native dog. It was brought to Iceland with the first Viking settlers (AD 874 - 930). The Icelandic Sheepdog and its method of working adapted to the local terrain, farming methods and the hard struggle for survival of the Icelandic people over the centuries, making it indispensable in the rounding up of livestock on the farms. The Icelandic Sheepdog’s popularity has increased over the last few decades and, despite the fact the breed is still very small in numbers, it is no longer considered to be in danger of extinction. It is most likely descended from dogs introduced by Scandinavian colonists. It is probably a relative of the Norwegian Buhund. 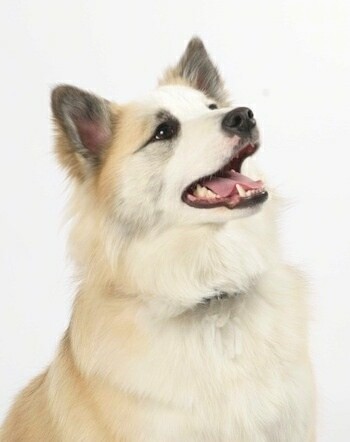 The Icelandic Sheepdog was recognized by the AKC in 2008. Falki (Frostfyres Mesti Thorpari Falki) the Icelandic Sheepdog at 14 months old—"Falki, a registered Icelandic Sheepdog arrived in Alaska at 10 weeks of age from far-away Virginia. My husband, at age 58, was recovering from a TBI (traumatic brain injury) and was sadly missing our old Border Collie, who had recently passed away. We wanted a cheerful, intelligent, people and dog friendly dog—not too big—who would get along with the rest of our pack; a Great Py, a Spitz / Collie cross and an older Mini-Doxie / Chihuahua. An Icie sounded like a great idea on paper…a herding breed like our old BC, but a little smaller and not quite so intense...or so we thought. I have to admit, we didn't take seriously enough the part of the breed standard that said their main "herding style" was barking. ;) Falki's "job" was to be "companion dog and buddy" for Jerry...and hopefully a happy, persistent responsibility that would get him up and more active. He promised to take "his dog" on long dog walks, puppy classes, housetraining, trick-training, etc. The plan was to give Jerry (we hoped) the motivation to be more active as he recovered. "Falki arrived and a whole new world opened up for us. He was and is definitely one of the most cheerful little dogs I've ever met! Sadly, Jerry's recovery proved much too slow and a puppy can't wait. So it was Deb (wife) who walked the puppy, took him to dog classes, worked on his house manners and generally bonded with Falki. To keep him busy and content (Icies are high-energy dogs), Deb started him in beginner agility classes and hoped she could keep up (not being young herself). He loved the sport and was totally fearless as he was introduced to (low) teeter-totters, jumps, ramps and tires. We whipped through that class and the next (intermediate) agility classes. We started Treibball (the "Urban Herding" sport of herding/pushing exercise balls across a field and into a soccer net) and had a great time. Then we got serious and tried Rally Obedience. Oh boy! Give an Icelandic Sheepdog something to do—a task or job of any sort, and they'll show you just how well it can be done. 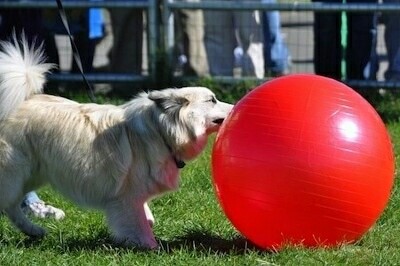 "Jerry still doesn't walk any of the dogs much (2 1/2 years after his accident), but Deb is getting plenty of exercise! Falki is about ready to start trialing in both agility and Rally (we get to enter under "Veteran Handler" due to Deb's age), and is still having a blast pushing big balls around the Treibball field. Our Great Pyrenees Journey is a working livestock guardian dog as well as a gentle companion (she has four pet goats and two sheep to watch), our Spitz / Collie cross Abby is a therapy dog and Deb's ideal quiet, lovable companion dog (she goes to work with Deb three days a week) and little Pocket the 14-year-old Mini-Doxie / Chihuahua turned out to be Jer's bosom buddy and nap companion. Our newest rescue pup Baxter the Dachshund, at 14 months of age discovered a love of the (fairly) new dog sport of Nose Work and is currently enthusiastically sniffing his way through the intermediate classes. Falki is, as you can see, part of a bigger pack. Fortunately, Icies love being part of a group and thrive on attention. Falki may not have succeeded in getting Jerry motivated, but he sure got Deb up and moving more. Do not get a herding breed dog if you don't want to actively interact with your dog(s) on a daily basis. Don't get an Icelandic Sheepdog if you want to stay depressed and expect to nap a lot. Just don't. Neither of you will be happy. On the other hand; get an Icelandic Sheepdog and you will not be able to keep a smile off your face at their nonstop cheerfulness and attention-getting antics. They are fearless, energetic, happy dogs who firmly believe everyone and everything (except big birds) are their friends. They have adorable black "eye-liner" and erect but extremely mobile ears. They pick up training and tricks quickly. They will listen attentively to you, cocking their heads back and forth as if taking in every word you are saying, agreeing with you totally...and then they will clearly tell you, "OK, if we're done talking, can we go play now?" :)""